Despite significant tax subsidies from the state and federal government, North Carolina's private providers are building their fiber-optic networks only in certain metro areas and none in rural regions. 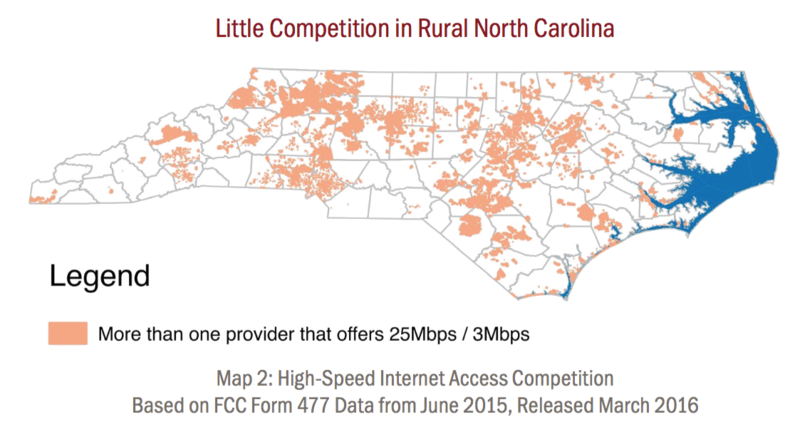 Only 12 percent of North Carolina's rural population has a choice for their broadband access, the rest are stuck with only one option and no control over their Internet prospects. All of North Carolina's telephone cooperatives are investing in fiber for members in their service territory, some have entirely replaced their copper lines with fiber-optic. While North Carolina has 26 electric cooperatives capable of bringing fiber-to-the-home to rural residents, a 1999 state law (N.C. Gen. Stat § 117-18.1) limits the co-ops' access to capital for telecommunications projects. As high-quality Internet access continues to be more and more essential for everything from education to basic commerce in the 21st century, North Carolina has a dramatic inequality of access across the state. Though 4 out of 5 rural residents have at least basic broadband access (defined as a minimum of 25 Mbps download and 3 Mbps upload by the Federal Communications Commission), access to higher capacity connections tends to be limited to some urban areas. As more devices develop greater appetites for bandwidth, rural areas are being left behind. Local government efforts in some urban areas have recruited Google, Ting, and other companies to deploy fiber-optic infrastructure. In some of these newly competitive areas, AT&T and CenturyLink have upgraded their last-generation networks with fiber-optics. However, rural communities pose a greater challenge for the private sector model and have seen far less investment. The maps in this report con rm that almost all private sector investment in fiber-optic networks in North Carolina is within urban areas. Simultaneously, the vast majority of rural areas have either zero or one option for basic broadband access. Examining the rural areas with high-quality access shows a common denominator: cooperatives. North Carolina has 8 telephone cooperatives and each of them has already invested in fiber-optics; 6 of them have already replaced or aim to replace all their old copper with fiber-optics. Some of them are bringing fiber-optics to nearby areas outside of their historic territory long neglected by the big incumbent telephone companies. North Carolina’s rural residents largely receive electrical service from an Electric Membership Corporation (EMC co-op) and several of the state’s 26 EMCs have begun investing in fiber-optics to help their communities. Telephone and electric co-ops should be a major focus for improving Internet access across the state, but a state law passed in 1999 limits EMC access to capital for telecommunications. Another state law — known as H. 129 when it passed in 2011 — limits local government authority to build networks. The city of Wilson’s Greenlight citywide fiber-optic network connects the community’s largest employers and has attracted high tech firms to town. Its rural neighbors are desperate for it to expand but the state prohibits Wilson from sharing its network with the region. During a period when H. 129 was struck down by the FCC, Wilson had expanded Greenlight to Pinetops, a small community with a packing plant that desperately needed the connectivity. A recent court decision reinstated H.129 and Wilson will now have to cut Pinetops off, leaving it without basic broadband access. Arbitrary limits on expanding successful networks serve only to protect the politically powerful cable and telephone companies, not local businesses and residents. That plan is essentially a “one-hand-on-deck” policy that naively pins the future of the state on the big telephone and cable companies. North Carolina should adopt an “all-hands-on-deck” approach that recognizes the need for a mix of business models in providing essential infrastructure across the state. Local leaders are better equipped to solve their problems than micro-managers from Raleigh. Some communities will embrace cooperatives, some may find ways of attracting private companies, and some may choose to work with Wilson or duplicate it. This report recommends that North Carolina remove its barriers to local choice and focus on encouraging more sources of investment rather than focusing largely on firms based outside of the state. MuniNetworks.org works with communities across the United States to create the policies needed to ensure telecommunications networks serve the community rather than a community serving the network. We publish original news, reports, multimedia, and fact sheets. Christopher Mitchell, the director of our Community Broadband Networks initiative at the Institute for Local Self-Reliance works on telecommunications issues — helping communities ensure the networks upon which they depend are accountable to the community. He has consulted the White House and FCC on publicly owned networks speaks at conferences across the United States on the subject, occasionally to directly debate opponents of public ownership. We believe we make better and more informed policies when those who design those policies are those who feel their impact. ILSR works with citizens, activists, policymakers and entrepreneurs to provide them with innovative strategies and working models that support environmentally sound and equitable economic policies and community development. Since 1974, ILSR has championed local self-reliance, a strategy that underscores the need for humanly scaled institutions and economies and the widest possible distribution of ownership.